ScreenCastle is a free online screen recording service which will allow you to Screencast directly from your browser and share it. All you need is Java installed in your PC. 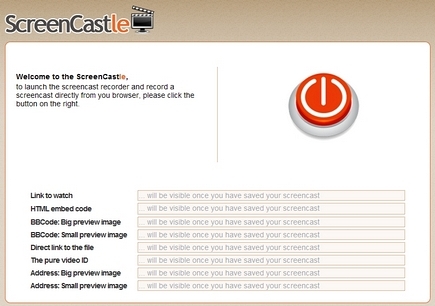 Visit ScreenCastle website and click on the round Red icon. Within few seconds Java Applets are initiated and Screen Recorder application will be launched. 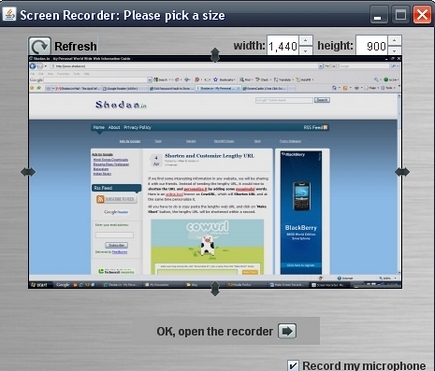 Adjust the Width and height as per your needs and click on “Ok, open the recorder” button. In your screen you will notice Recording options, Click on the “Start Recording” button. After screen recording you can preview the Screencast before saving it. Once screencast is successfully saved you will get various options like direct download link, HTML embed code in the ScreenCastle Website.